Marie is Born in Warsaw, Poland. In order to save money for college, she worked as a governess for the Zorawskis. Marie and Pierre hold a small ceremony in July. September 12, 1897 Irene is born as Marie's first daughter. In May, 1902 Wladyslaw dies. Marie describes her findings in the popular American journal the "Independent". Marie loses a child at birth on August 25,1903. December 6, 1905 Marie's second daughter is born. 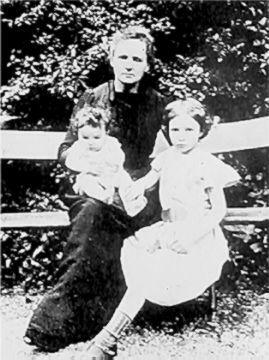 Here is Marie with her two daughters. Marie's beloved husband dies on April 19, 1906. Marie's father-in-law dies on February 25, 1910. France begins mobilization shortly before Germany declares war on France, Marie's homeland for many years now. The armistice signing at France symbolizes the end of WWI. Marie's first granddaughter, Helen, is born from Irene (her oldest daughter). Pierre Joliot-Curie is born as Marie's first grandson and Helen's little brother. May 29, 1932 Marie visits her homeland of Poland for the last time. Marie suffered from a large stone in her gallbladder. On July 4, 1934 Marie Curie dies of aplastic anemia. She is reburied in the Pantheon in France, and is the first woman so honored for her accomplishments. Marie registers as a student at the Sorbonne in Paris. Marie earns degree in physics from Sorbonne (finishes first in her class). Marie comes out first in the examination on preparing for a teacher's certificate. She completes her first scientific paper. Marie and Pierre discover the new substance named "polonium" after Marie's home country of Poland. Marie (and Pierre) discover their new element "radium". 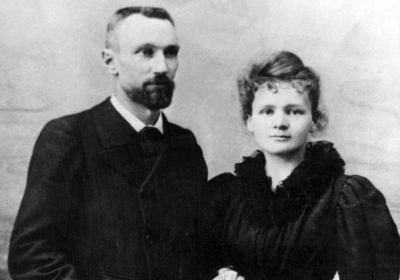 The Curies receive the Davy Medal from the Royal Society of London. Marie and Pierre (along with Henri Becquerel) win the Nobel Prize for physics. For the first time, Marie gets official rights in Pierre's laboratory as she is appointed the director. Marie is the first women professor at the Sorbonne. Marie is awarded her second Nobel Prize, but in chemistry this time. Marie established the standard for radium. Albert Einstein and his wife stay for a long visit in March 1913 at Marie's home. Marie helps fundraise for mobile x-ray units during WWI to help save soldier's lives. Presdient Warren Harding presents Marie with a gram of radium on May 20, 1921. The National Institute of Social Sciences awards its gold medal to Curie. Marie is gifted once again with the money to buy another much needed gram of radium to continue her research from America. It was presented to her on October 30, 1929 by President Hoover. 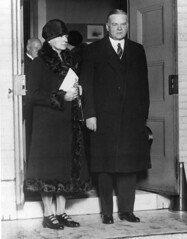 Here shows Hoover with Marie. Marie's daughter and son-in-law win the physics Nobel Prize.